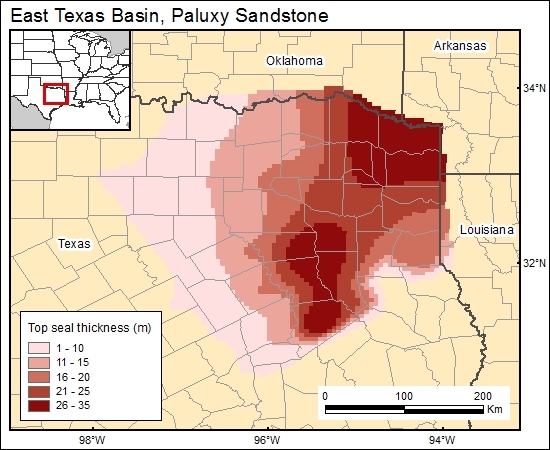 There are several low permeability units above the Paluxy sand in the area of interest, including the Goodland Formation and Edwards Limestone. However, argillite/carbonate facies in these units are not mapped in detail in this area. Therefore, we have chosen the Kiamichi Formation as the top seal for the Paluxy aquifer. The Kiamichi is widespread throughout the area. In electric-log cross sections presented by Anderson (1989) it appears to be a fine-grained, low-resistivity unit. Anderson mentioned that it is composed of terrigenous clastics. Neeley (1991) described the Kiamichi in southeastern Oklahoma outcrops as being composed of mostly argillaceous oyster biostromes with minor interbedded, dark-gray clay and shale and a few hard, argillaceous limestone beds. We assume that basinward (in the study area), the Kiamichi consists of mostly clay and shale. Thus, we identified the Kiamichi as a seal for the Paluxy and gridded the data (c7paluxyg). Anderson, L. M., 1989, Stratigraphy of the Fredericksburg Group, East Texas Basin: Baylor Geological Studies, Bulletin 47, 40 p.
Neeley, R. A., 1991, Facies analysis of the Lower Cretaceous (Albian) Goodland and lower Kiamichi Formations of Southeast Oklahoma: Shale Shaker, v. 41, no. 5, p. 116–145.